Since 1945, Booth Movers has been the premier choice for New Jersey furniture movers in the Bergen County area and beyond. Moving your household can be a stressful process, and safely transporting your valuable furniture requires an experienced New Jersey furniture moving company. Booth Movers is an award-winning business that employs highly-trained New Jersey furniture movers that you can count on to handle all of your relocation needs! With professional memberships and an affiliation with Atlas Van Lines, our New Jersey furniture moving services are completed using the most trusted names in the transportation industry. When you need the help of an experienced New Jersey furniture moving company, there is no better choice than Booth Movers! Since the beginning, customer care and high-quality service have been our first priority. It is our goal to treat you as a friend throughout every stage of your relocation! Whether you are moving down the street or to another country, you can trust Booth Movers to make your transition a seamless, stress-free process! Residential Movers – Booth Movers has the experience and expertise to handle residential relocations of any size, regardless of where life takes you! Local Moving – Having a team of local Bergen County movers on your side can make all of the difference when planning a seamless relocation. Long Distance Moving – When it comes to long-distance relocations, our experienced team will guide you through each stage of the moving process! Household Moving – From small apartments to large family estates, there is no job too big or too small for our New Jersey household moving company! Interstate Moving – To make your relocation to a new state a stress-free experience, count on Booth Movers to handle all the details. Full Service Moving – Our wide range of fully customizable moving services will provide you with a relocation experience that will exceed all of your expectations. International Moving – Our global network of moving and storage professionals allows us to efficiently handle all the details of an international move. 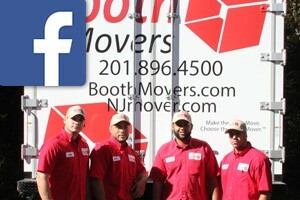 Are you ready to find out more about our New Jersey furniture moving company? Give us a call, or fill out our online form today to request your free, no-obligation estimate!